I can't even begin to explain how incredible this experience was. From the moment I met my handler in person after multiple emails throughout the weeks (who was one of the nicest people I've ever met, might I add), to the moment I stepped off the red velvet stage after the American anthem (amid the ear-piercing screaming from all the 12s), I savoured every second of it. Felt it in my bones, to the depths of my soul and back. Sadly, my guests weren't allowed to film the performance from the field, so I didn't get any footage, but hopefully the Seahawks will pull through and send some soon. 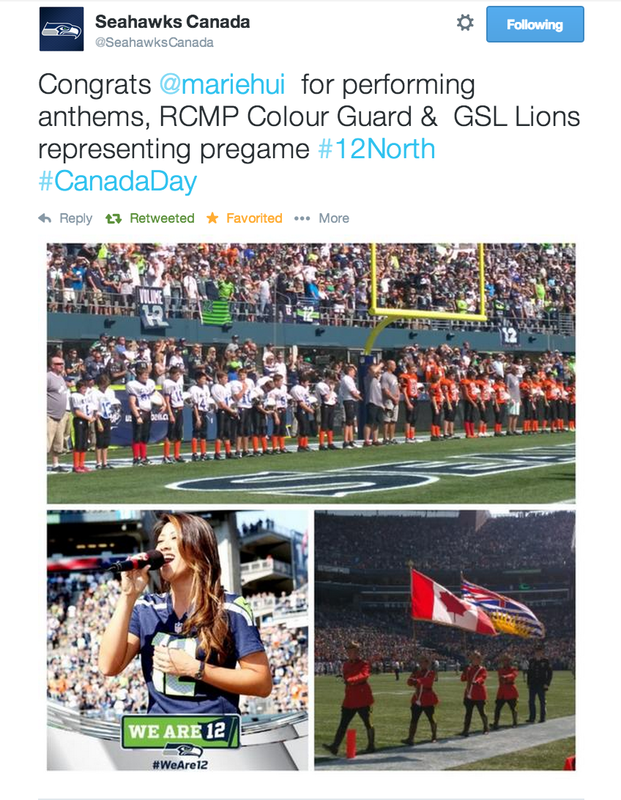 In the meantime, I've compiled some of my own photos, some fan photos and some screenshots of the @Seahawks and @SeahawksCanada tweets. See below! The love and support from all my friends, family, twitter, facebook, media and all the people that came up to me after the anthems to tell me I did a great job, was overwhelming. I feel nothing but gratitude - thank you, from the bottom of my heart. 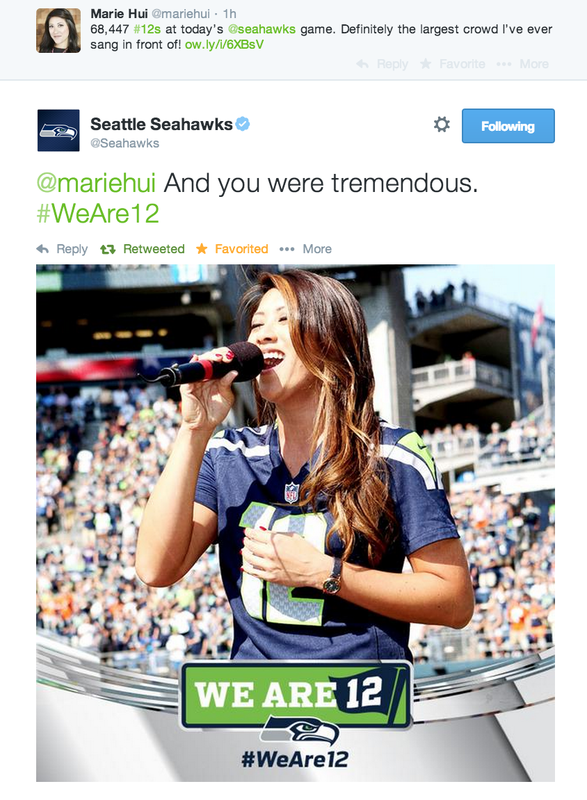 "@thebro88: @mariehui I'm a long time @Seahawks season ticket holder and honestly that was one of the best Anthems I've heard. Had goosebumps." Special thanks to Keli and Omar from the Seahawks organization for making this all happen for me, Joan from Crest & Crown for sponsoring my eyelash extensions, and C, Tiff and Janine for joining me during this momentous occasion. 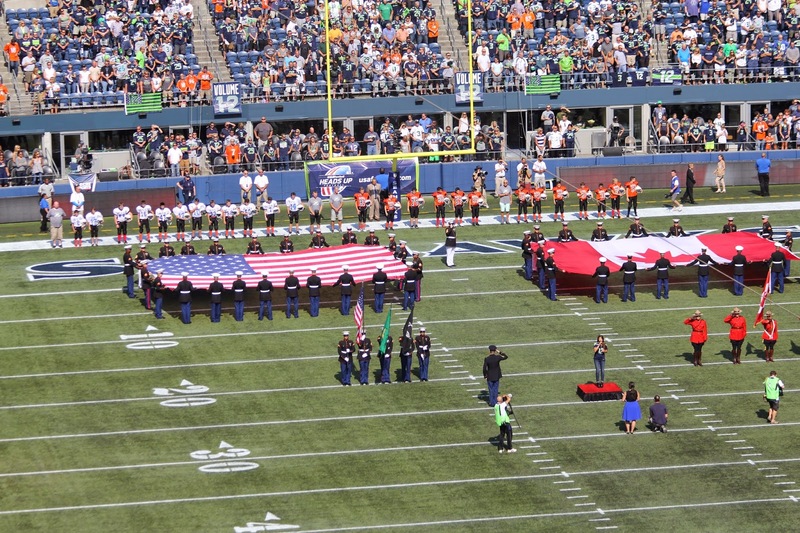 I hope I made all Canadians proud on Seahawk's Canada Day! I hope I get to perform on CenturyLink Field again one day! Here's a video that someone took and graciously sent to me. It's the only video footage I have of the performance! Hope you like it! Here's an audio clip of the American anthem, The Star-Spangled Banner. Listen to the crowd roar!